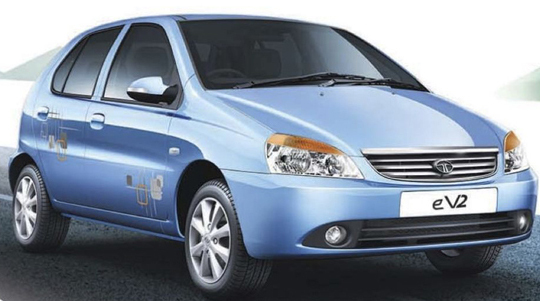 Coming from the family of Tata is in itself a boon for Indica which made its presence felt when it was launched in 1998. The opening was as anticipated, grand, and since then Tata has been increasing the production of Indica all across India. Presently, Tata probably has one of the most dealership units based across the country. Tata Indica was rolled as a hatchback segment distinguished from others. Owing to its demand amongst Indian citizens, Tata brought out more and more advancements in the form of new upgrades. The Tata Indicae V2 version of Indica came out into the market last year and was taken well by enthusiasts owing to the fact that ‘e’ stood for economics. Thus, the primary agenda of Tata behind launching eV2 was to bring out a car which is fuel efficient and still boasts of a powerful engine beneath its hood. It is being righteously said that the automobile industry of India is nowadays earmarked as one of the fastest growing empires across the world with most of the automobile heavyweights across the world. Revamped models and new faces are being introduced every now and then. Indica was something that was considered as a rage amongst Tata enthusiasts when it was launched on the roads. The taxi industry also brought Indica into mainstream and the popularity gradually increased. Now, a new era kicked off in which fuel prices skyrocketed to optimum limits without even looking over its shoulders. Thus, Tata played the role of a saviour and introduced Indica eV2 last year in order to tackle fuel prices head-on. This comes as a Diwali gift to people of India as the launch had been awaited since a long time. Tata Indica eV2 gives out a mileage of 25kmpl way ahead of its compatriots. Its prime competitors in the market include Maruti WagonR, Ford Figo, Chevrolet Beat and Maruti Swift. Now, as usual, a new face on the street never treads without us pushing it behind a scanner. So hereby, we put Indica eV2 to test. Lots of alterations can be seen in the new facelift version of Indica. Let us commence with the front part of the car. The front part including the bumper and the headlights are more bulging than they were in the previous version. The overall look given to new Indica is much sleeker and edgy which makes the car look sporty. There has been a change in the design of the grille as well. The new grille fitted to the car is chrome plated and much more refined than the grille of the previous Indica. The headlamps in the new version are much more stylish than before. The stop lamp this has been kept at an elevated level. There are a few more updates that need to be mentioned. The new Indica eV2 now comes with a rear spoiler which gives a sporty touch to the car altogether. Adding to this, there will be alloy wheels attached to the car. The earlier versions of Indica never came with alloy wheels option so this time Tata decided to go with a new outlook. The rear view mirror on the outer column of the car bears the same colour as that of the body. There is an additional metal strip that goes along the lining of the car. Even the grille boasts of having a chrome strip attached to it. Thus, altogether when it comes to the exteriors of the car, new Tata Indica Ev2 does sound promising. 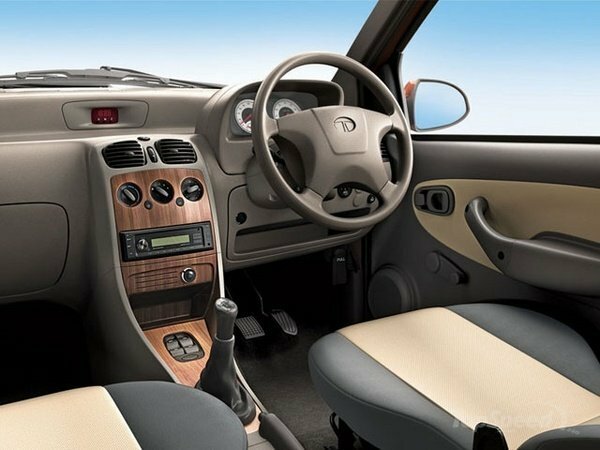 Moving over to the interiors of the car, Tata before launching this model had promised to its enthusiasts that the new Indica eV2 interiors would definitely strike a chord with the people. There have been lots of adding and dropping inside the cabin but the final conclusion surely deserves praise. This time, space has been considered by Tata designers and as a result, we have more spacious interiors with enough boot space to keep luggage as well. There have been lots of inclusions inside the cabin in order to make it look more luxurious. The height of the car has also been elevated as per which even a tall person can sit comfortably. When it comes to the seating arrangement, five people can easily be accommodated without any adjusting whatsoever. There is a lot more that Tata has put into Indica eV2 which we will discover only when we are behind the wheel of the car and sitting comfortably inside the cabin. Coming to what lays beneath the hood, Tata Indica eV2 boats of having 1.4 Litre common rails CR4 Diesel engine capable of delivering a maximum power of 70PS at an rpm rate of 4000 rotations per minute. The engine has been built as per Bharat Stage IV norms of emission which is the reason why it is considered as fuel efficient and at the same time less pollutant. The maximum torque which it can give is 140 Nm at 1800-3000rpm. Tata Indica eV2 comes in 5-speed manual transmission system. The suspension system of the car has been newly upgraded as per road standards which in turn will give the driver an easier drive over rough terrains. Tata Indica eV2 boasts of a smart engine management (SEM) chip which monitors how the engine is functioning and at the same time gives the engine an extra thrust. Handling was one of the primary motives of Tata while designing the components of the car. Thus, the new Indica promises better handling along with better braking systems for safety concerns. Not only does Tata Indica eV2 deliver a promising performance but at the same time ensures that there is no compromising in terms of safety. When it comes to comfort, new Indica does fare better than a few of its counterparts. One of the prime features which support this claim is the auto-drive assist system as per which the driver has the liberty to remove his foot from the throttle even when the car is elevating and adding to this, the engine performance does not degrade ever after removing the foot. The clutch-to-start option is another feature worth highlighting. This features makes sure that there is no chance of engine cranking and maintains the functioning potential of the same. Power-steering is there in all variants of the model along with strong air conditioning. There is a headrest that has been provided in both the front seats and these supports can be adjusted as per self convenience and that too in two ways. Now coming to the fuel lid opening, most of the cars generally have handle which we are supposed to pull in order to open the fuel lid. Tata instead of going with the preceding trends, decided to make the whole thing automatic. Now the fuel lid can be opened just at the push of a button and that is all that takes it to open. Even the tailgate opening works by the same means. There is a new feature inclusion in the Indica eV2. The antecedent versions never had power windows on all four doors but Indica eV2 facelift has power windows operational for all the four windows of the car. There are a few key safety features which have been worked upon by Tata ever since the components of Indica eV2 were being put together by the able designers of the automobile major. Some of these features include ABS, three-point ELR seat belts, anti-submarine seats, collapsible steering, high-mounted stop lamps, child lock, etc. The topmost variant of the car boast of the central locking system which other variants lack unfortunately. The topmost version will also be having both front as well as rear fog lamps as an additional safety feature. 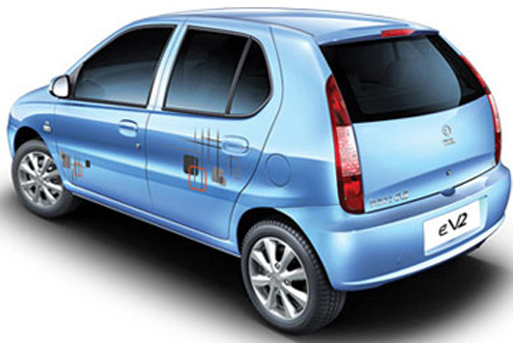 The base price of new Tata Indica eV2 has been fixed at Rs 401,162 and the range went up to Rs. 487,619 for the topmost model. Last year Tata came up with the facelift version of Indica eV2 which was also one of the most fuel efficient cars by the company giving a mileage of 25 kmpl which is much more than what other cars of the segment offer.